This Kids Fashion Store Clean OpenCart Theme is a ready-made eCommerce website solution. It's designed to create powerful and impressive online stores. The wide possibilities of adjustment will allow tweaking every visual element. And integrating the necessary functionality. This is complemented by a high degree of SEO optimization, thanks to which your store will be able to get the highest positions in search results. This will greatly simplify the further promotion of the finished website on the Internet. This website loads quickly and works without holdups. 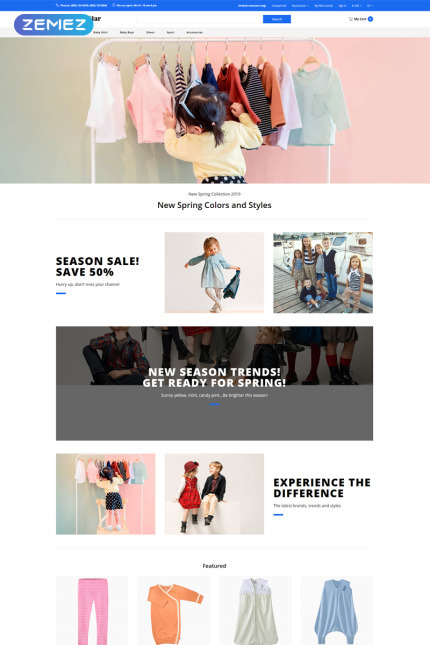 This Kids Fashion Store Clean OpenCart Theme is a stylish solution enhanced by powerful functionality. Ideal for an online store website.